A great teaching tool that can really help you educate your audience is Microsoft PowerPoint. Understanding how to use this tool along with your Camtasia Studio presentation will truly help set your clip apart from others. Using the add-in is very simple but first it needs to be installed. When you first download your 30 day free trial of Camtasia and begin to install it, the installer asks if you’d like to install the Camtasia PowerPoint add-in. Make sure you select this option. If you have already installed Camtasia, you can simply reinstall it and select this option. After installation of the add-in, open Microsoft PowerPoint. In Microsoft PowerPoint 2007, choose the Add-Ins tab. There in custom toolbars, you’ll see the Camtasia Studio add-in. If you have a microphone, you can also add voice narration to this slide. If you have multiple slides in a presentation, you can advance to the next slide by selecting the right arrow key. 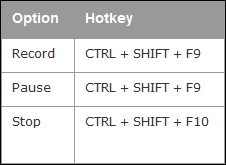 Once you have completed the recording, hit the escape key. A dialog box will ask if you would like to stop the recording or continue the recording. Choose ‘Stop Recording’. Choose a location to save the recording. Save this edited file with an easy file name to remember. (For example if the PowerPoint presentation will be the opening of your clip choose the name ‘Intro’ as your saved file.) You will then be asked if you would like to produce your recording or edit your recording. Choose ‘Edit your recording’. Edit your recording using Camtasia Studio and save the edited file. Now you can record your screencast. When you’re finished, open your edited PowerPoint recording and import to it the newly recorded screencast. Using the Camtasia Studio PowerPoint Add-In, your presentations will have an added element of ‘Wow’. This entry was posted in Computers and Technology on December 20, 2013 by admin_z.